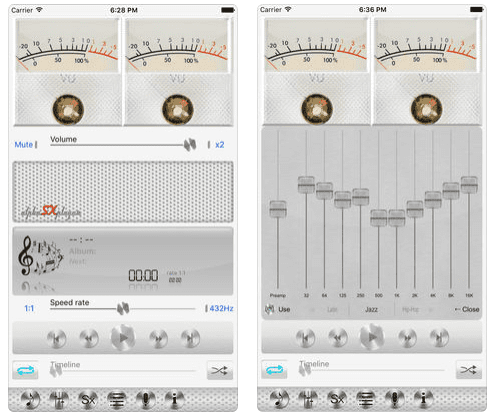 alphaSXplayer is a free and powerful iOS audio player with recording function. Unlike most other players, it allows you to adjust the playback settings and apply various sound effects. These additional settings give a lot of pleasure from the process of listening to audio recordings and give new opportunities for practical use of the player. Adjustable playback speed without loss of sound quality. A variable sound timbre allows you to change the tone of the sound without changing the playback speed. Switch between standard and 432Hz keys. The setting of La at 432Hz is considered more harmonious for human hearing and allows listening to music (especially classical music) in exactly the way it was conceived by great composers. In addition, the sound of La 432Hz is considered more favorable for the soul and useful health. 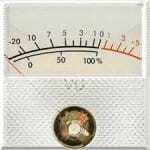 Ten band equalizer with various presets (classics, pop, rock, jazz, itp). Built-in sound effects, such as reverb, distortion, echo and many others with lots of customizable parameters and presets. The preamplifier allows you to make the sound louder than it is originally. Built-in voice recorder allows you to record audio from a microphone in MP4 files in a subfolder of documents and then play them with the imposition of special effects. Playback and recording levels show realistic arrow indicators. An intuitive user interface makes it easy to select files from the library, adjust settings and manage playback. 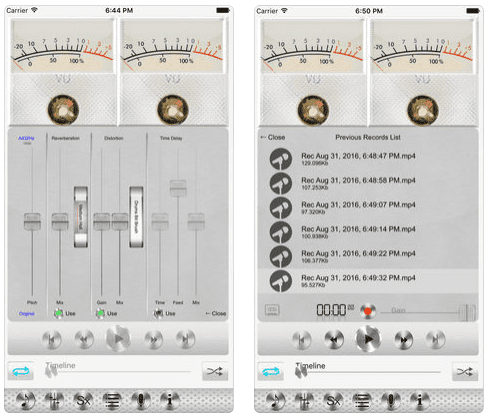 Supports all recommendations from the Apple’s iOS Human Interface Guidelines for audio applications. Learning foreign languages: slow-motion playback of the recording to catch all the nuances by ear. A built-in audio recorder can be used to record new phrases. Audiobooks: allows faster playback of audiobooks. In this case, the inevitable change in tone can be compensated for by adjusting the timbre. Much fun for all ages! alphaSXplayer is a wonderful and easy-to-use player for learning and entertainment. Even the basic free version contains many available settings, and the full version will give even more features and tools.